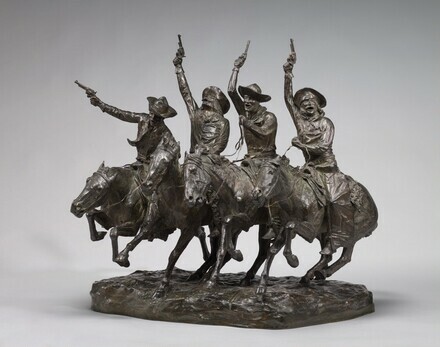 This virtuosic sculpture depicts four cowboys astride their galloping horses "shooting pistols and shouting," as Frederick Remington wrote, suggesting the bravado and energy that characterized the frontier way of life. One look at the horsemen reveals that they are not attacking or escaping from enemies, however, but rather immersed in drunken revelry. Remington wrote of the cowboy: "When he ‘turns loose' in town [he] does it in a thorough way. His animation vents itself in shrieks and yells, the firing of the revolver, and the mad gallop." One of the most prominent artist-interpreters of the American West, Remington produced a large body of work in sculpture, illustration, painting, fiction, and nonfiction that popularized the cowboy as a national folk hero. Working in his studio in New Rochelle, New York, between his frequent travels west, the artist based the lively composition of Off the Range on two of his earlier illustrations and on other images of "the charge." Off the Range is the artist's most complex sculptural group. Remington pushed the structural limits of the bronze medium, boasting to the owner of the Roman Bronze Works foundry during the casting: "I have six horses' feet on the ground and 10 in the air." Four of these 10 belong to the horse on the far left, whose hooves do not touch the ground at all. In 1905, the Corcoran Gallery of Art purchased this sculpture and Mountain Man (1903, also National Gallery of Art, Corcoran Collection), making it the first museum to acquire Remington's bronzes. The Corcoran apparently was unwilling to embrace Remington's subject and asked him to propose an alternate to the copyrighted title, Coming Through the Rye. Remington offered Off the Range, the name of his monumental plaster of the same subject shown at the 1904 Louisiana Purchase Exposition in St. Louis; Corcoran director Frederick B. McGuire approved the new title as "much more appropriate for the work." (M. Knoedler and Co., New York); purchased February 1905 by the Corcoran Gallery of Art, Washington; acquired 2014 by the National Gallery of Art. 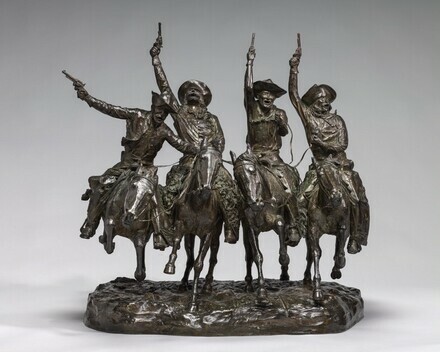 A Collection of Lost Wax (Cire Perdue) Bronzes by Frederic Remington Done by Roman Bronze Works, M. Knoedler & Co., New York, January 1905, no. 4, as "Comin thro' the Rye". Past and Present: 250 Years of American Art, Corcoran Gallery of Art, Washington, 15 April - 30 September 1966, unpublished checklist. 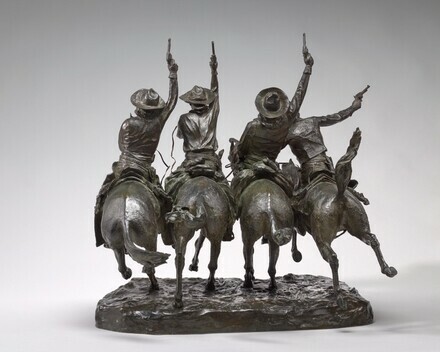 The Wild West: Paintings and Sculptures by Frederic Remington and Charles M. Russell, New Orleans Museum of Art, 1979-1980. The American West: Selections from the Anschutz Collection and the Corcoran Collection, Corcoran Gallery of Art, Washington, 25 March - 26 April 1981, no. 26, repro. Picturing the Corcoran's Sculpture: Photographs by David Finn, Corcoran Gallery of Art, Washington, 3 November - 30 December 2002. The American Evolution: A History through Art, Corcoran Gallery of Art, Washington, 1 March - 27 July 2008, unpublished checklist. Corcoran Gallery of Art. Catalogue of the Sculptures in the Corcoran Gallery of Art. Washington, 1922: 62, no. 2052. Cash, Sarah, with Terrie Sultan. American Treasures of The Corcoran Gallery of Art. New York, 2000: 135. Finn, David, with Susan Joy Slack. Sculpture at the Corcoran: Photographs by David Finn. New York and Washington, 2002: 100-101. Heartney, Eleanor. A Capital Collection: Masterworks from the Corcoran Gallery of Art. London, 2002: 204-205. Barter, Judith A. Window on the West: Chicago and the Art of the New Fronter, 1890-1940. New York, 2003: 88, 99.